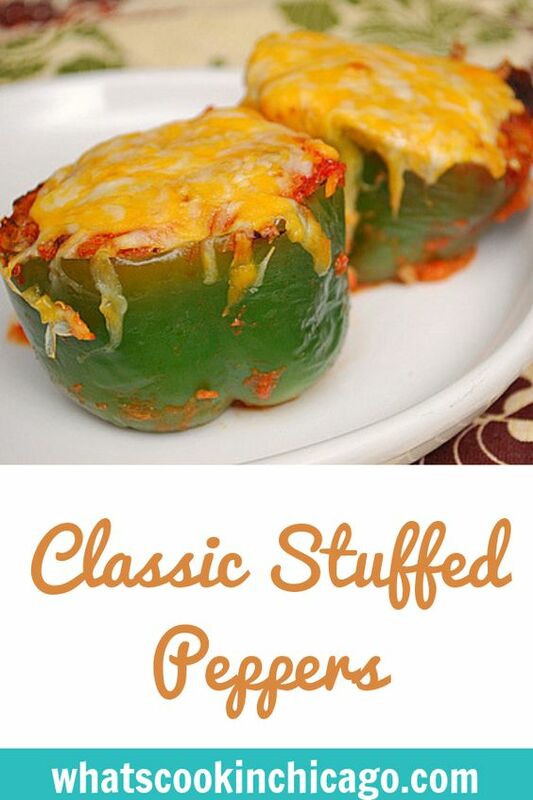 When was the last time you had a stuffed pepper, if at all? For me it was ages ago and from what I remember, they weren't all that great. The peppers were either too overcooked and mushy or undercooked and crunchy. Even the rice stuffing was a challenge to cook perfectly with the peppers. However, this recipe tackled those issues. The result were peppers with the perfect firmness and a tasty filling of meat and rice cooked just right. In this recipe, the peppers are blanched before filling, allowing the peppers to soften just a bit and finish baking in the oven. As for the filling, a mixture of cooked rice and seasoned ground beef are combined with tomatoes and cheese. 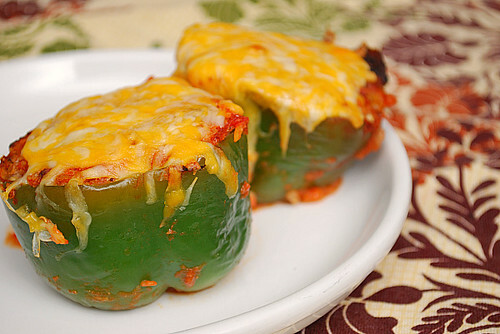 The peppers are stuffed and baked, and topped with cheese for a final touch. Preparing this for the freezer or as a make ahead meal is easy too and I've included instructions as well. Bring 4 quarts water to a boil in a large stockpot or Dutch oven over high heat. Add 1 tablespoon salt and bell peppers. Cook until peppers just begin to soften, about 3 minutes. Using slotted spoon, remove peppers from pot, drain off excess water and place peppers cut side up in 9 inch square baking dish. Meanwhile, heat 12 inch heavy bottomed skillet, such as a cast iron skillet, over medium high heat until hot, about 1 1/2 minutes; add oil and swirl to coat. Add onion and cook, stirring occasionally, until softened and beginning to brown, about 5 minutes. Add ground beef and cook, breaking beef into small pieces with spoon or potato masher, until no longer pink, about 4 minutes. Stir in garlic and cook until fragrant about 30 seconds. Transfer beef mixture to bowl with rice; stir in drained tomatoes, 1 cup cheese, parsley and salt and pepper to taste. Using soup spoon, divide filling evenly among peppers. Stir together ketchup and reserved 1/4 cup tomato juice in small bowl. Spoon 2 tablespoons ketchup mixture over each filled pepper. Sprinkle the remaining cheese over each pepper and bake in the preheated oven until cheese is browned and filling is heated through, 25 to 30 minutes. Serve immediately. 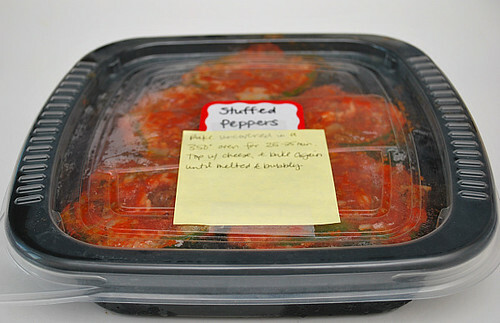 * To make ahead/freezer meal - Prepare the recipe as directed above, however place and fill the peppers in an oven- and freezer-safe container. Stir together ketchup and reserved tomato juice in small bowl. Spoon 2 tablespoons ketchup mixture over each filled pepper and freeze. When ready to prepare, defrost completely. Adjust oven rack to middle position and heat oven to 350°F. Bake in the preheated oven until filling is heated through, about 25 to 30 minutes. Sprinkle each pepper with 1 tablespoon of cheese and bake until cheese is melted (or browned if you prefer). Serve immediately. I love stuffed peppers!! These look great!! I never thought to top them with cheese, I usually just top them with more sauce! This is my go to recipe. I love it so much. Great recipe. these look so amazing, i'd never thought to top stuffed peppers with cheese thats such a delicious idea! These look really tasty... I love stuffed peppers! I've never attempted to make them myself, but I definitely will now! I'd love to make this- sounds like the perfect recipe! And cant wait to get started. I'm just not sure where the ketchup is so-post to go? Can someone please tell me when i add it? I didn't see it posted. These look delicious! I've never seen a recipe that uses ketchup. Does it make the stuffed mixture thicker? I never thought to cook the ground beef as well as the rice before you stuff them. We make a raw meatloaf mixture with raw rice and use a tomato sauce/ spagetti type over them and around them, cover and cook them for like an hour. It cooks the beef and the rice absorbs the tomato and beef juices. Hi where do i get containers like that? Finely grate carrots, zucchini and onion into any dish that has ground beef, like: meat sauce for pasta, meatloaf, chili, sloppy joes, tacos, etc. Where do you get your black oven/freezer pans from? I would love to get some of those! I got mine at WalMart, when they have them. They REALLY are oven proof(without the lid), and re-usable. Just be sure the sides do not touch the oven side when baking.